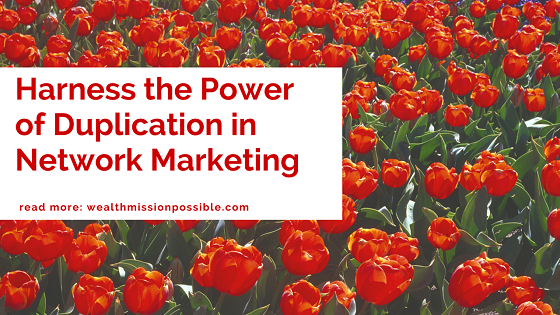 What if I told you that the power of duplication in network marketing is the key to serious profits? That’s right—by teaching duplication to every new team member you could be on track to real success. I know what you are thinking? 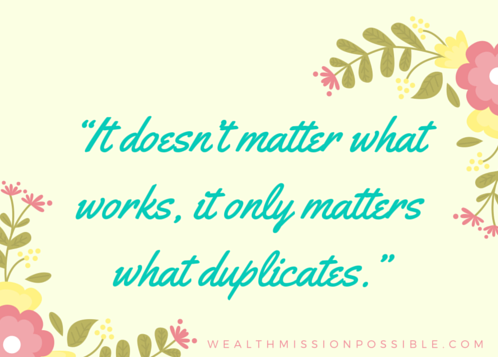 What the heck is duplication and how does it help build my network marketing team? Learn the 17 Irrefutable Laws to Build a 6-Figure Residual Income in YOUR Company, and Set Your Family Financially Free! That’s exactly what this post is all about. Have you ever been successful with a certain way of doing things that works really well for you but not anyone else? Your role is network marketing is to get a large number of people to do a few simple things over a long period of time. If you come up with something that works for you, but is complicated or difficult for most people to do over the long haul, building a network marketing team will be out of reach. 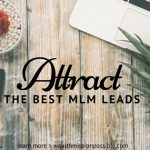 For example, suppose that you know the owners of several skin salons and have great success getting these owners onboard in your skincare based network marketing business. Do you think that is easy for new team members to duplicate? Of course not. They don’t have the same connections as you. Let’s say you are an expert and go out and present yourself as an expert. You give tons of facts and exhibit your expertise to a prospect. That person may be interested in what you are saying but they are really thinking: I can’t do what you do. This is why it’s important to have a system in place that is easy to understand and do for anyone that joins your team. Have you heard the term “MLM system” thrown around a lot? It’s a method to teach duplication in network marketing. Finds people with whom to share information. Help those people make an informed decision. Enroll them as a customer or distributer. Finding success in network marketing does not come from mastering a thousand things. It comes from mastering a few things and doing them thousands of times. Exposure (sharing information) is everything. Results are not everything. Results will come but we must do the work. The work is exposure. Learn how to Recruit Quality Leaders into YOUR MLM business even if you are just getting started. Think of exposure as just a form of advertising. Our reward comes from our willingness to go out and share our business with people. It’s called network marketing for a reason. We are paid to go out and network with others and share the information. The best way to do that is with a systematic approach which is really the power of network marketing team duplication. Have you heard the term “third party?” It means exactly what it says. Can you imagine if we all had to be experts on every product from our network marketing company? Yikes! The truth is that we are not scientists or walking encyclopedias. The most important component to leverage the power of duplication in network marketing is third party tools. Think about this: We are really in the information delivery business. Our job is to simply get the information out there. Getting the word out and how you get the word out is extremely important. You always want to share information with people using a third party tool. All these things (3rd party tools) tell the story so you don’t have to. More important, you don’t want to because you don’t want someone to base their opportunity or product buying decision on how good you are at explaining it! For new distributors, third party tools are simple to use. For example, if someone is brand new how can they possibly go out and be an expert about the products or opportunity? But… they can point to a third party tool right? A 3rd party tool is also a screening tool so find out who is and who is not interested. Don’t keep talking to the same 5 people 20 times. Instead, talk to 100 people once and look for the ones who are looking and open to opportunity. Look for the ones that are excited about the products. If this business does not work for new people, it just does not work period. Have you ever been mesmerized by someone’s story? Or at least very interested? How interested would you be if that same person rattled off a bunch of facts and figures to you? You would not be too interested. Here’s why stories are more important than facts. Any person can say: I am using this great product and I feel so amazing, etc. Then just point to a 3rd party tool. Be an expert at pointing and not explaining all the facts about the product. Any person can say: I am working with this great company that I love! I love the people I work with, they make products and I am so fired up. I don’t know if it’s for you or not but I am super excited and we are having so much success that I wanted to recommend that you take a look at it. It may or may not be for you but I highly recommend that you check it out. Anyone can do that. Simple. 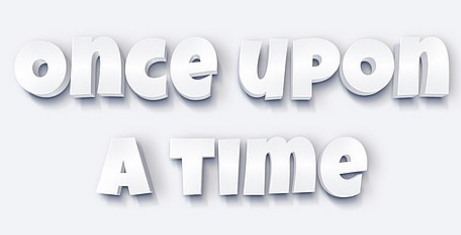 Don’t feel like you have a story to tell…or know how to tell it? Click here and watch this massive FREE training. And you don’t have to explain anything difficult. Remember, it’s a find share, and point job! That is an example of the power of duplication in network marketing! Duplication in network marketing is the key to success for your team. Duplication starts with you and it’s what success looks like in this business. Use a simple system that works, and teach it to all new distributors. How are you duplicating success in your network marketing business? Share in the comments below. 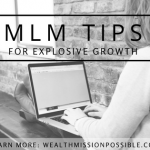 Grab your seat for this week’s live MLM marketing webinar. Wednesday 9PM Eastern! For duplication to be successful, you need to gather a lot of people that are extroverts and can communicate the message that you want to send to the people, but in a manner that keep them interested and willing to buy. I know from past experiences that It’s quite a difficult profile to find, so most of the time you need to train them properly to get better results on a certain MLM niche. I don’t buy into the duplication thing, at least not in the way that most network marketing companies describe it. It’s mindless, like you’re looking for lemmings. I was talking to another distributor with my network marketing company about one of our products a couple days ago. She has the item and uses the item but she couldn’t tell me anything about the item, other than what’s in the brochure. I don’t see how you can sell anything if you can’t answer a few simple questions from your customers. I duplicate what I do with my team. I teach them to build a website, like you have done here, and promote the products to make retail sales. Most people will soon quit, if they even get started. The ones who stick with it long-term will make money. This way you don’t need a lot of people to make money and you only work with people who are motivated to do something. That’s what I want to duplicate.